Here's what l know about professor Stephen Hawking. 1. He's, like, the brainiest person on the planet (probably). 2. He's confined to a wheelchair and talks through a machine. 3. He left his wife for his nurse. Any of these facts alone would make for an unconventional love story. Together, they weave a tale as complex and delicately balanced as a mathematical equation. Here, boy meets girl doesn't equal happily ever after in the way we expect from the movies. 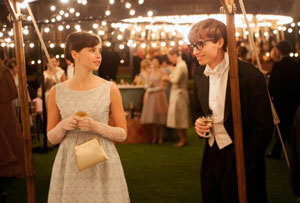 It's 1963, and sweet, hamster-faced arts student Jane (Felicity Jones) meets gawky, clumsy, science postgrad Stephen Hawking (Eddie Redmayne). Yet the couple barely have time to fall in love before Stephen is diagnosed with the debilitating muscular condition Motor Neurone disease and given just two years to live. Clearly it's no spoiler to reveal that this desperate prognosis proves incorrect. So rather than a tragic Love Story early check out, we have a couple's very real struggle to make the best of a bad hand, as Stephen's health degenerates and Jane's academic ambitions are pushed aside in favour of childcare, hoovering and round-the-clock nursing, while her husband single-handedly changes the face of science, one painstakingly computer dictated word at a time. The Hawkings' story may be a lump-in-throat triumph of love and determination over adversity, but that's not the only triumph to be celebrated here. 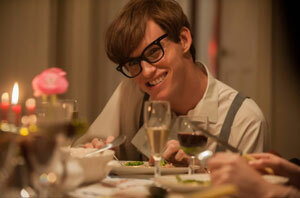 If lovely Eddie Redmayne doesn't win an Oscar for his performance here then there truly is no justice in Hollywood. Playing a real person? Check. Playing someone with a disability? Check. Losing a shedload of weight? Check. Effecting a total physical transformation, twisting his limbs, contorting his face, slumping, hunched, in his wheelchair? Oh, check. But it's not just Hawking's appearance – or even his genius – that Redmayne conveys so well (the genius bit is, thankfully for those of us without a phD in physics, mostly confined to the usual Beautiful Mind clichés of scribbled equations and tweed suit-wearing students frowning through tutorials in wood-panelled rooms). Anyone who's watched The Big Bang Theory must be well aware that Hawking has a sharp sense of humour, and here his dry, off-the-wall wit, softened by a heartbreakingly sweet smile, shines in the film's darkest moments. Kudos also to Felicity Jones, whose slide from fresh-faced romantic to weary wife and mother on the verge of a nervous breakdown is almost as impressive as Redmayne's, and to the ever-marvellous David Thewlis: who else could play Hawking's tutor and mentor but Professor RJ Lupin? The Theory of Everything leaves us with Hawking's mantra that where there's life, there's hope. But the film is also a poignant meditation on the nature of love, and the different forms it can take. We (okay, I) may weep buckets over Up or The Notebook, but one love story doesn't fit everyone, and for every Carl and Ellie, Allie and Noah, there are a hundred Stephen and Janes, whose love grows and changes and embraces new people. Just as Stephen has yet to neatly package up life in one beautiful equation that explains everything, so in this history of a romance, boy meets girl may not equal happy ever after in the tidy Disney sense, but it still ensures a life rich in love and affection. And that really could be the answer to everything.